00:05:00 Makes 12 servings, 1 cup (250 mL) each. This sparkling beverage serves a crowd. 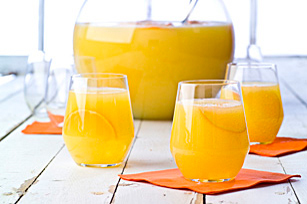 The flavours of lemon and orange shine through in this better-for-you fruity punch. Stir first 4 ingredients in punch bowl until drink mix is dissolved. Add oranges. Serve over ice. Prepare using CRYSTAL LIGHT Pink Lemonade Flavor Drink Mix. Punch can be made ahead of time. Mix all ingredients except ginger ale and oranges in large glass or plastic pitcher until drink mix is dissolved. Refrigerate until ready to serve. Pour into punch bowl. Add ginger ale and oranges. Serve as directed. This colourful refreshing punch is the perfect beverage to serve at your next brunch. And as a bonus, the orange juice provides an excellent source of vitamin C.